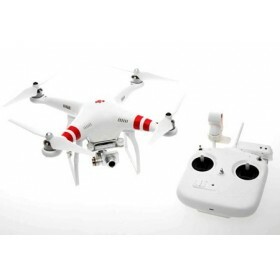 The DJI Phantom 2 Vision+ V2 is very easy to set up and just as easy to fly with all you will need in one box to start making your first aerial film, the DJI Phantom 2 Vision+ V2 system has been designed to be used everyone. A built-in high precision 3-axis camera stabilization system brings a whole new level of smoothness to aerials photography and you can shoot fully stabilised video from the sky, right out of the box gives, the DJI Phantom 2 Vision+ Version 2 allows you the total creative freedom in the sky. 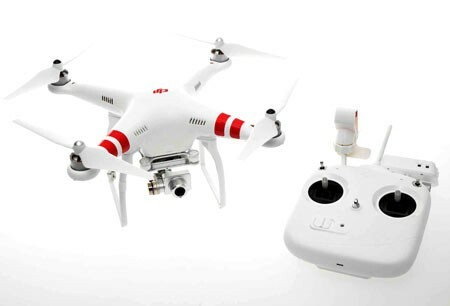 The DJI Phantom 2 Vision+ Version 2 carries a high quality camera and comes supplied with a 4GB micro SD card. The camera included with the DJI Phantom 2 Vision+ Version 2 delivers full HD video @ 1080p 30p / 60i, for clean slow motion and still images are taken at 14 megapixels with a 110 degrees FOV @ 1080 30p and 85 degrees FOV @ 1080 60i. The Vision+ camera has a number of user adjustable features, these settings including Picture Quality, ISO, Exposure Compensation, White Balance and capture format can be adjusted through the Vision app on a smart phone. You can fly for up to 400m away from take-off (in optimum conditions) using the Wi-Fi connection, this allows you to receive photos and videos from the DJI Phantom 2 Vision+ Version 2 straight to your phone using the Wi-Fi, no computer required at the field! The use of a smart phone with the Vision+ means that you are able to view and Keep track of current flight telemetry with the on screen display. The DJI Phantom 2 Vision+ Version 2 gimbal allows the camera to be tilted as you fly, so you can create the graceful moving shots or point the camera straight down for a totally unique view of your local world. When you have finished your flights the DNG RAW photo capture means all original image information is retained for powerful post processing. An Adobe lens profile for barrel distortion removal is available for the DJI Phantom 2 Vision+ Version 2 camera. It is available as standard in the latest versions of Adobe Lightroom and Adobe Camera Raw for Photoshop. 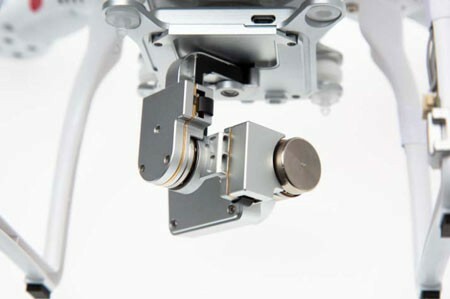 The radio control system for the DJI Phantom 2 Vision+ Version 2 operates on the 5.8 Ghz band which will allow for flights in direct line of sight of up to 400 meters in optimum conditions.